As a part of ‘STAMPMANIA 2009’ the First National One Frame Philatelic Exhibition being organized by Baroda Philatelic Society, Vadodara from 17th to 20th December 2009 and to celebrate 135th Birth Day of Sardar Patel, Baroda Philatelic Society has released a Special Printed Postcard on 31.10.2009. 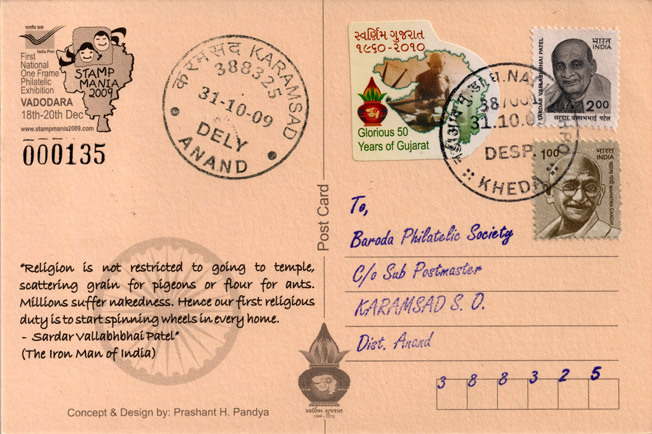 The postcard has been mailed from Nadiad (Birth Place of Sardar Vallabhbhai Patel) on 31.10.2009 and delivered at Karamsad (Home Town of Sardar Patel). 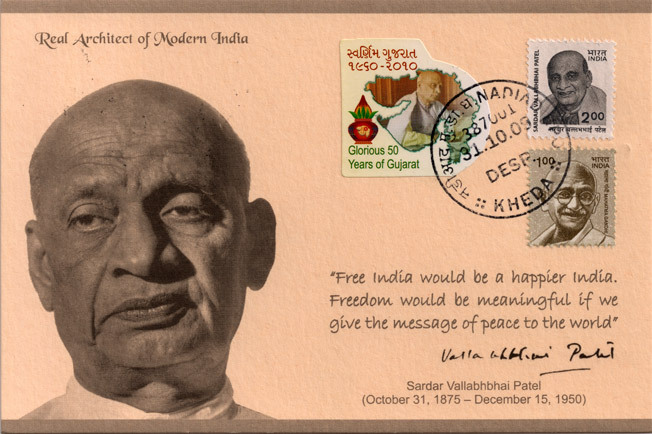 Self adhesive labels on Sardar Patel & Mahatma Gandhi with motif of Swarnim Gujarat (Glorious 50 Years of Gujarat) were also released on 31.10.2009.